The Fells Point Festival is just one week away. I find that so exciting and freaked out that time is just flying. And As promised, the pizza theme of this neighborhood continues. 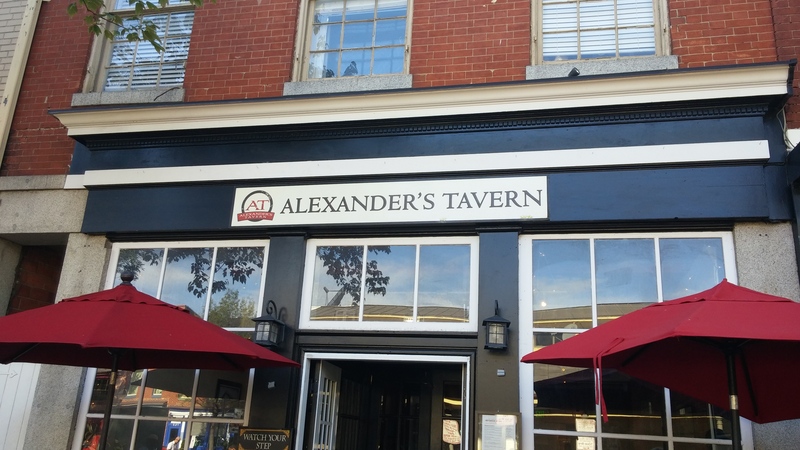 This visit brings us to a much more favorable spot, as opposed to last week, Alexander’s Tavern. A month-and-a-half ago a huge group of us were out in the neighborhood for a dear friends birthday. Several stops were made but none were better than this location. Our group of about 50 or so had taken over the entire front bar area. And there was such a powerful and magnetic energy in the room. My words alone will not do it justice. The day was phenomenal. And speaking of that, I saw a few friends eating a few appetizers and other foods to soak up the libations that were being procured throughout the afternoon. To my pleasant surprise, a couple pals were eating pizza. So I just had to jump on this opportunity while I was there. Now I’ve noshed here a multitude of times before and always enjoyed myself. I forgot they served pizza and shame on me for that fact! After making several inquiries to the friendly bartenders and perusing the menu, the unanimous suggestion was to order the 3 Little Pigs! Mama Mia! I had this in early August but the taste still resonates with me. The crust was thin and just perfect. On just a visual level it was almost too beautiful to eat. One thing about me, I’ve never seeked out red meat on my pizza. It’s just never been near the top of the list for me. It’s not that I don’t love it. I just prefer chicken, vegetables, seasonings, yummy sauce, and of course lots of cheese. But this is something else. 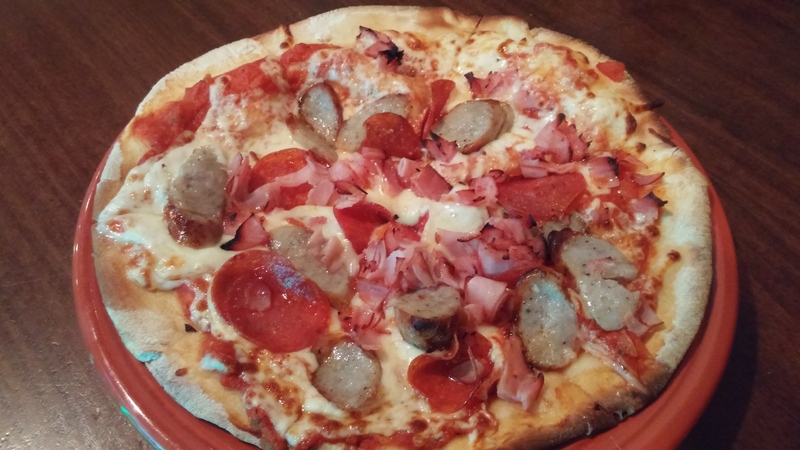 The trios of ham, pepperoni, and sausage taste so fresh and so real. For a second, I thought all this meat could clash and some flavor might be lost. How wrong I was! I also do love some ham so this was a treat. Just looking at the toppings I can tell this is real quality and a lot of effort was put into preparing this. I took a few pieces off my mini slices and ate them individually and it was glorious. The sauce and cheese were easy to taste even with all that meat piled on top. My mouth is watering at the though of having one right now. The presentation was inspiring as well. I found the plate that it came on to be very charming. Whether the color was intentional or not, I don’t know. But I do believe they do serve red plates and I find this detail to be an added bonus. And it went perfect with my wine! These are personal size pizzas and I would’ve devoured another one. But I also found this too good not to share. 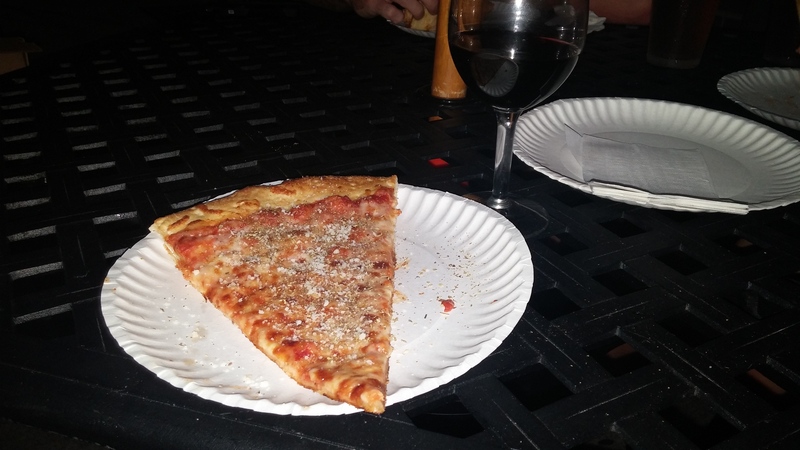 I passed around a few slices to the buds of our birthday crew, and the positive reviews were unanimous. It was superlative city. Being in a great mood also helps. Everything just felt right about the day. And the was pie is stupendous, sensational, and splendid. It was so good that a little over-the-top alliteration was necessary. And they’re only $6 on Thursdays! That’s highway robbery! This pizza is worth every penny and then some. 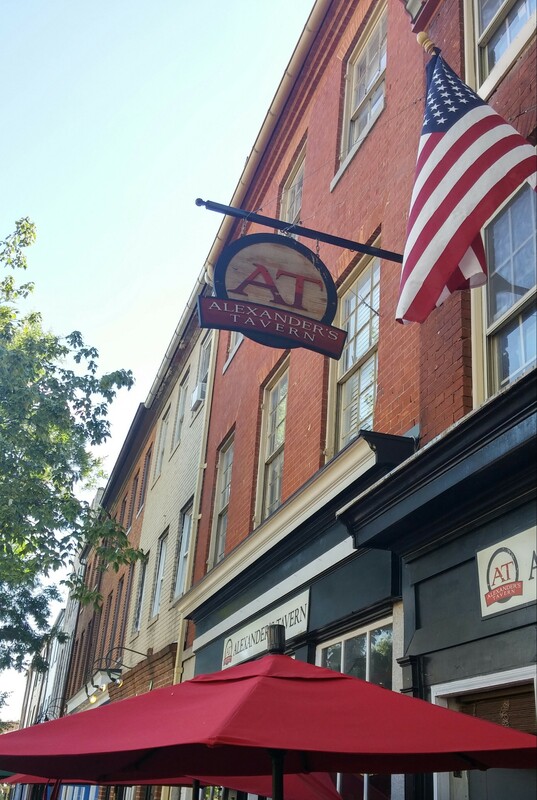 If you’re in the neighborhood or going to be headed to the festival next week, I strongly recommend stopping by for a pizza or anything for that matter. I’ve always had a great experience here. And I cannot wait to try some more of their creations. The Fells Point Fun Festival is the first weekend in October. 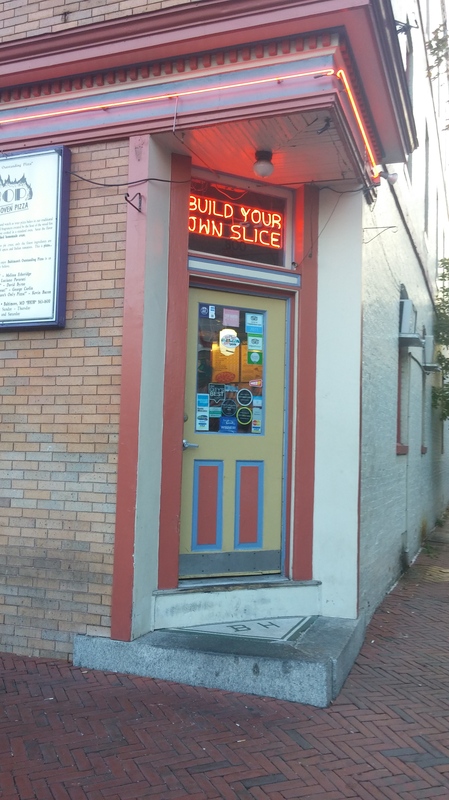 For at least the next four weeks, the posts will be dedicated to a pizza joint (or wherever I made eat a pie or slice) in this historic neighborhood. 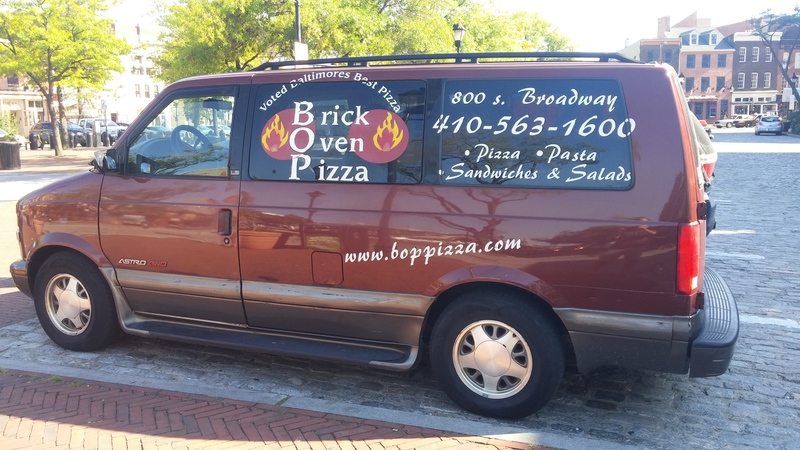 I knew for a while that I was going to write about Brick Oven Pizza. This is not going to be pretty. 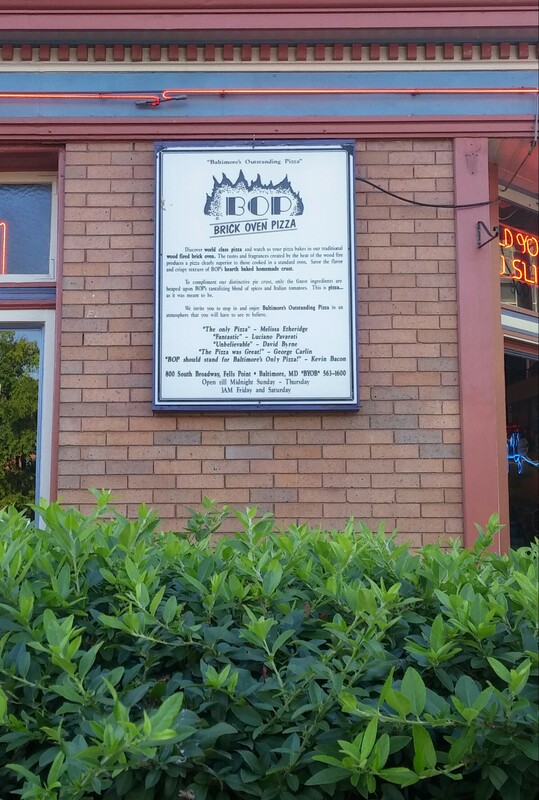 I had been eating here since moving to the area in 2000. And like many a tourist I either discovered it by walking around the neighborhood after a night of libations, or through word of mouth. It’s been a while but for me I think it was the former. And then the latter after learning more about this amazing part of the city. And if memory serves me correctly, I loved it the first time I ate it. I loved it all the way up until about 2007 or 2008. And I’m not quite sure what happened. 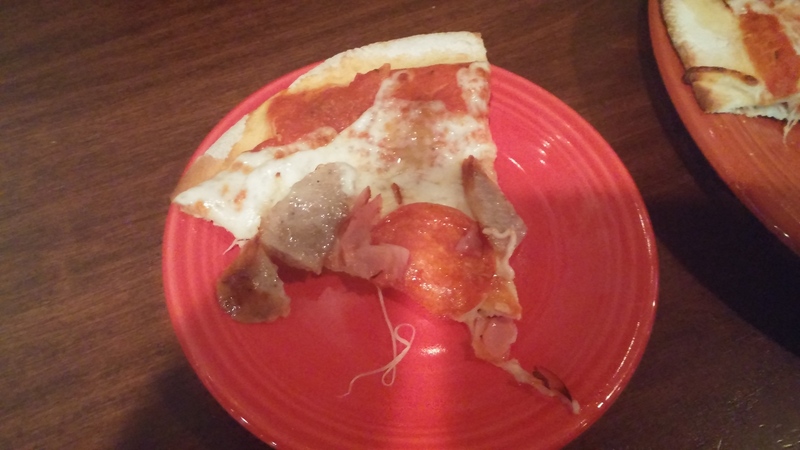 Either the quality of the food got cheaper, the way the pizza was prepared and heated changed, or my tastes went into a whole different trajectory. Lets be clear. At one point this was my favorite place for pizza. I craved getting pies of all flavors. 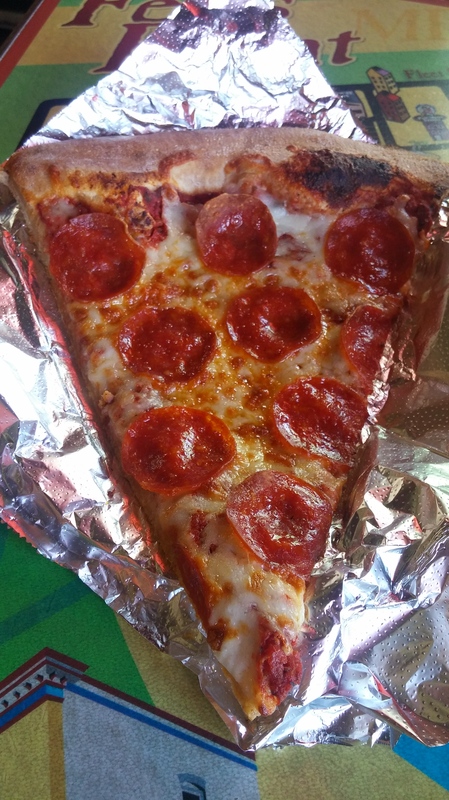 I loved the cheese, white, pepperoni, and many other toppings. When I lived in Towson, during and after college, my friends and I would make special weekend trips to get a couple of boxes for carry-out. I thought it was quality pizza. And high quality at that. Not anymore. In the late 2000’s to now I have seen such a sharp decline that it’s alarming. I’ve eaten here day and night and the quality has been lackluster regardless of the hour. I wanted to think that the effort is not quite there after the bars close vs. during the day, but it’s bad all-around. But yet I kept going back because I wanted to believe that the quality would resurface. 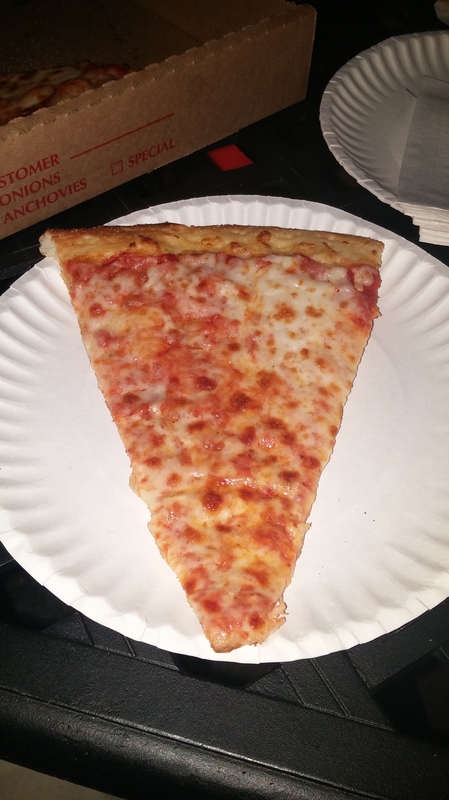 And it’s one of the first places I grabbed a slice when living in the area. Then I started to go out of my way to avoid it. What’s even worse now is when I’m in the area, I don’t even think to go unless it’s with friends or for the purpose of this blog. 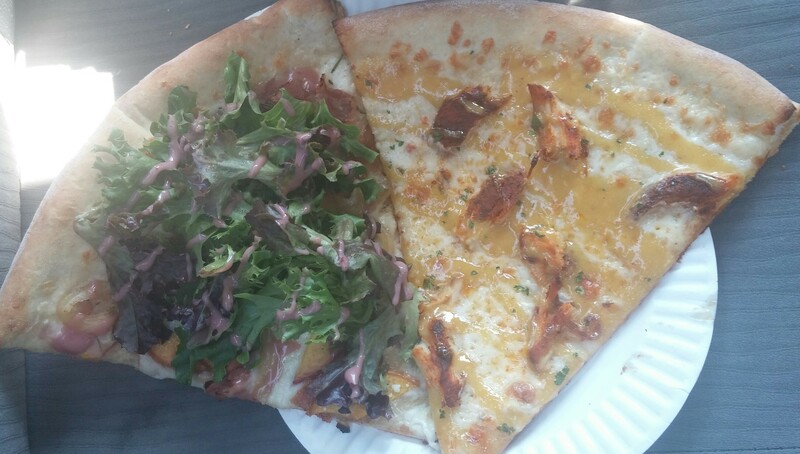 And speaking of that, I will be reviewing four slices, albeit briefly, which took place over two different visits. One was during the day and one was near closing time. It doesn’t matter which took place when as they were all pretty disappointing. When I said I will be brief I was serious. The order does not matter but I got a cheese, white, pepperoni, and that funny looking one. 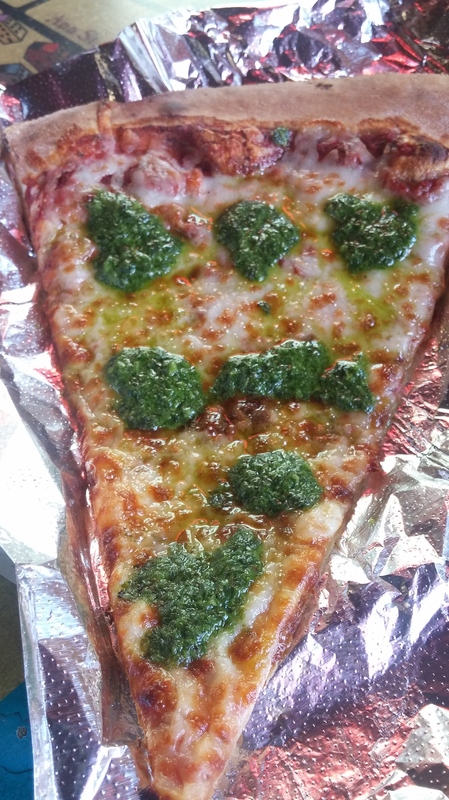 That’s a cheese with pesto on top. I had ordered a white slice with said pesto and they gave me that. I wasn’t even in the mood to tell them they messed up, as the point is moot. There is no soul to this pizza anymore. The crust, the cheese, and the toppings had no flavor. Sometimes I felt like I was eating soap. It was a struggle to finish any of these. They look so much better than they tasted. The dough was cooked funny and I don’t see how a brick oven can make this. It’s a tragedy. And for what they charge there is no justification. These are not premium slices. The staff working the front has also left a lot to be desired. I get people have bad days but a lot of these folks seem to phoning it in. And that energy reverberates to everything. I think the celebrity testimonials are wonderful but I suspect many are from years ago, when the pizza was impressive. I write all this because I care. I miss the old B.O.P. And I don’t it coming back. In a way it’s heartbreaking but it’s also time to move on. Every now and again if I’m desperate maybe I’ll grab a slice but there are food options elsewhere. Many folks from the area will disagree and I understand. Some of my friends are loyal to this place. I was but my heart isn’t there anymore. It’s time to move on. 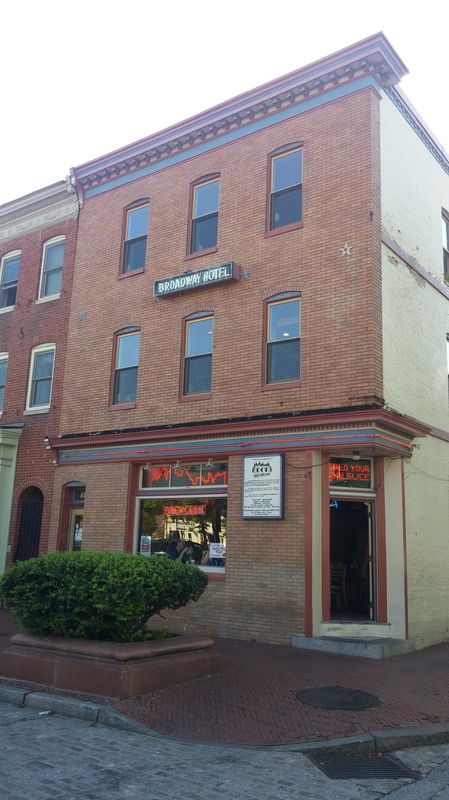 I can only hope the Fells Point pizza will get better from here. This past Saturday, September 5th, 2005 was a day I made sure to mark down on my calendar. 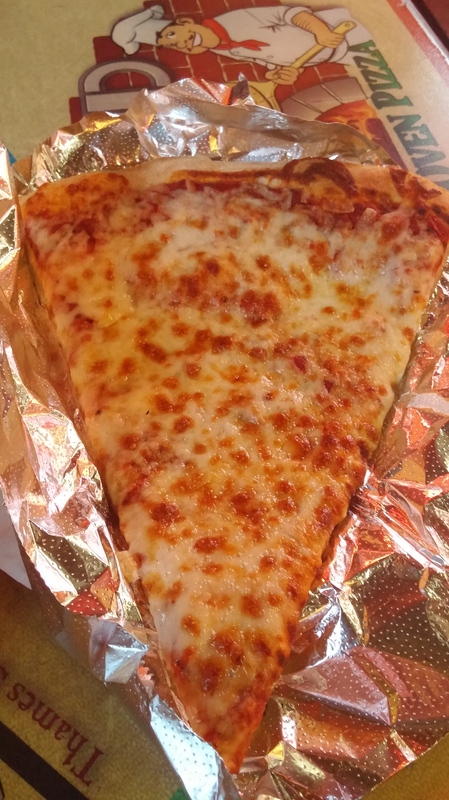 I didn’t believe it ahead of time, but it was National Cheese Pizza Day. Yes there is a day dedicated to one of the most enjoyable things to nosh on. In honor of this historical fact I wanted to find a place that would be befitting of such a monumental day in history. This also means there will be nothing artisanal, farm-to-table, or overly pretentious. 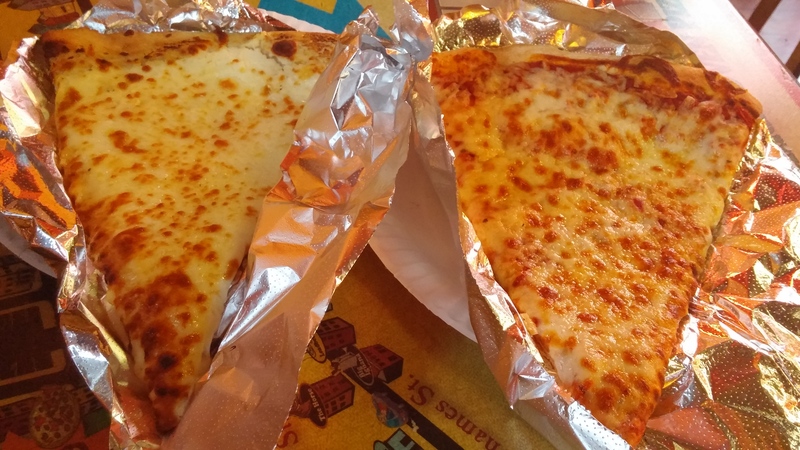 It’s about good old-fashioned cheese pizza that is no thrills but full of deliciousness! 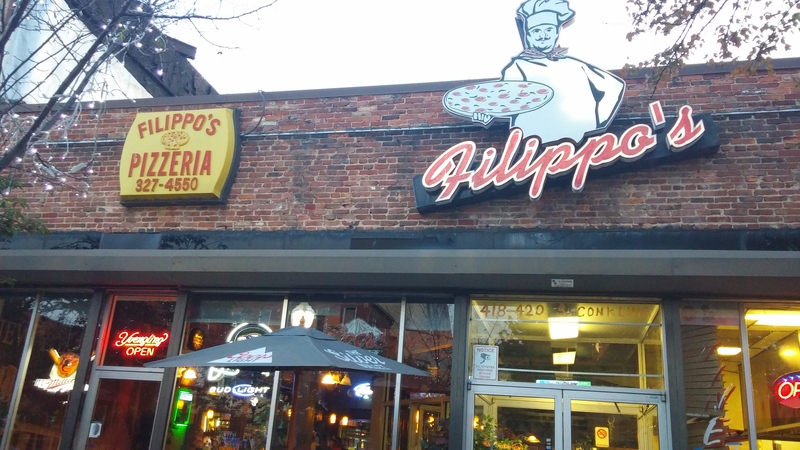 Nearly a month prior I visited Filippo’s in the Highlandtown neighborhood of Baltimore. If you had been going here before late last Summer, you saw the old Filippo’s. It had a feeling of a very old and sketchy neighborhood bar and restaurant. The times I had visited then felt so disorganized and disheveled that I actually found it refreshing to some of the more pretentious joints popping up all over the place. Nevertheless, it still felt uneasy being in there that I never felt good about my purchases. And they weren’t always up to par, food or drink. Transformation is a wonderful thing. Nearly a year ago the restaurant and bar has been refurbished to the point of being unrecognizable. And that’s meant as the highest compliment. It’s a place locals and visitors from farther away can be proud to say they’ve frequented. 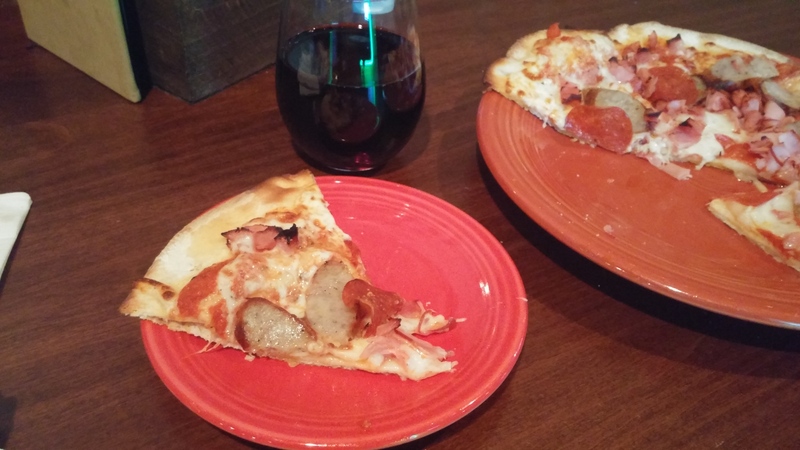 The pizza up until a year ago was mediocre-to-decent at best. Again, what a little hard work, belief, and rejuvenation can do! Of course a large cheese pizza was on the menu and that’s what was purchased. I believe we got the 16″ for the price of $13.99, and it was well worth what the asking price was. What a vision of beauty that is! When I think of a very good pie that doesn’t try to be something it isn’t, this would be a strong example of that. The crust was the right mix of crispy with just a little softness to make a perfect balance per slice. 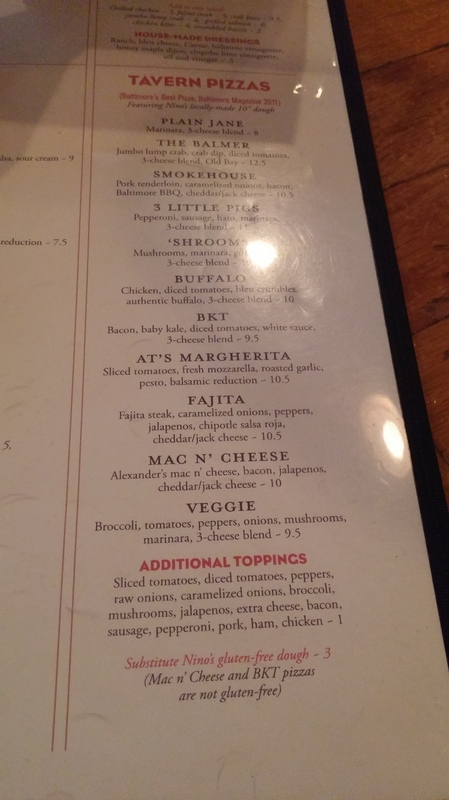 The cheese tasted like a great mozzarella would. And there’s always room to mention how awesome the cheese looks baked into the crust. It’s done with precision. And the sauce was just right. This makes this one of those quintessential pies that is worth seeking out for. It’s not going to win any awards but maybe that isn’t their intent. It’s just a delicious pie, in a thriving neighborhood, that deserves praise. 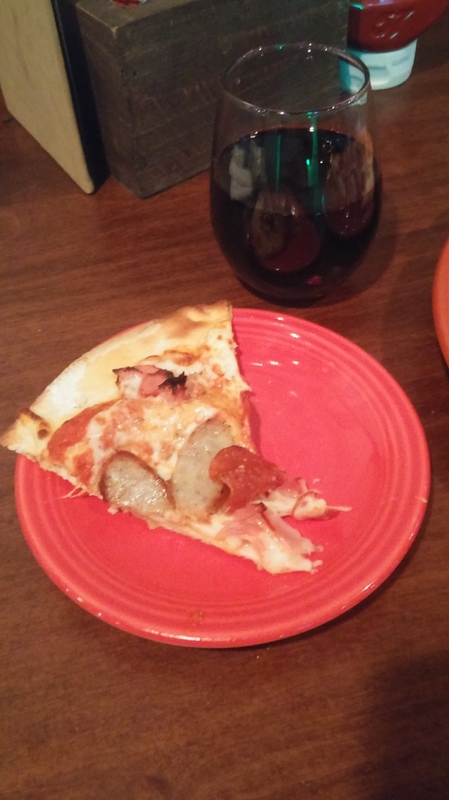 I enjoyed my slice with a glass of wine and drizzled some parmesan cheese in for good measure. 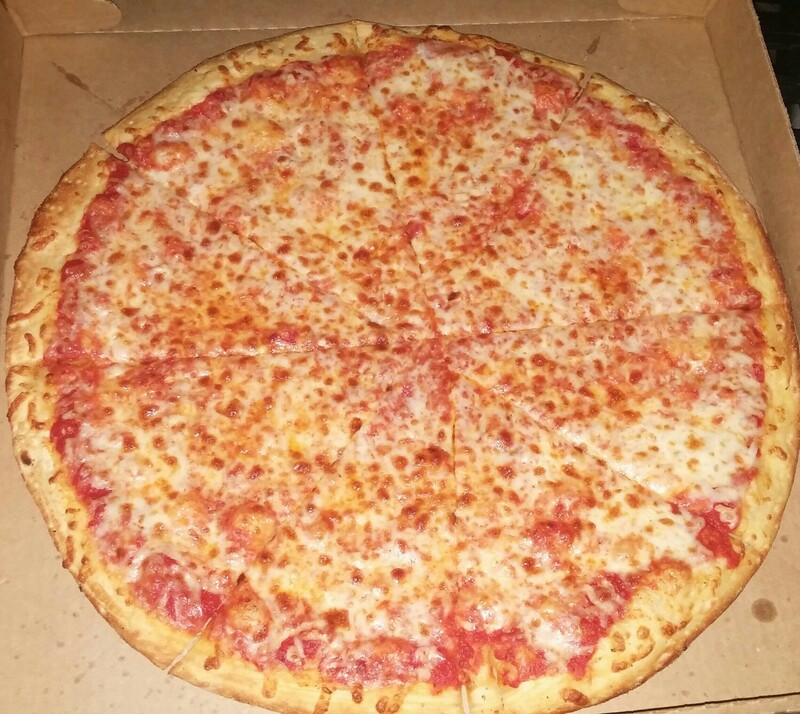 For a pizza pie to commemorate on National Cheese Pizza Day, this is one I’m grateful to have tried. I will add that the vibe and energy inside has increased ten-fold since they’ve redone the place. The bartenders have always been friendly and the outdoor seating has a cozy small-town feel going for it. If there is a complaint, the pie took a while to come to us and it wasn’t too busy of a night. They do have plenty of specials on drinks as well, more can be found here. This Summer has been one for the ages! And I don’t want it to end. It’s not only been fun writing about pizza. It’s just been fun in general. The whole reason for doing this is to feel good, enjoy life, and to make some pals along the way. That is what life is all about. An added bonus in my pizza travels, is that I get to be extremely random. I can write about anything pizza related and hopefully find the positive and sometimes spiritual in every situation. I had to take it back to the beach and this time I found myself in Rehoboth to be more specific. There’s a lot to love about this cozy and charming resort town. There’s great restaurants, shopping, bars, people watching, and of course the beach and boardwalk itself. So what about the pizza? Well there’s plenty of that. I had a list of places I wanted to check out and they were all in close proximity of one another, but fortunately plans don’t always go accordingly and something new throws you for a loop. I’m happy it did. This lead me to America’s Pie At The Beach. And what a wonderful surprise awaited me and awaits anyone else that tries their pizza! The staff could not have been more friendly and approachable. 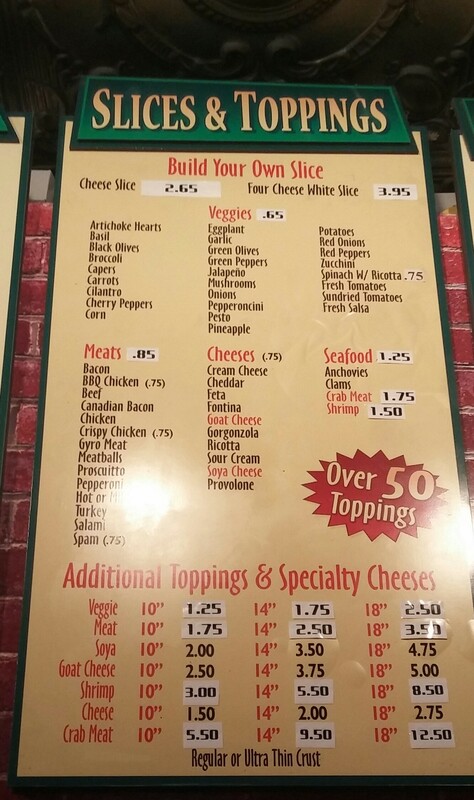 They had some unique selections to go with their cheese, pepperoni, white, etc. First was one they had literally just created that day. 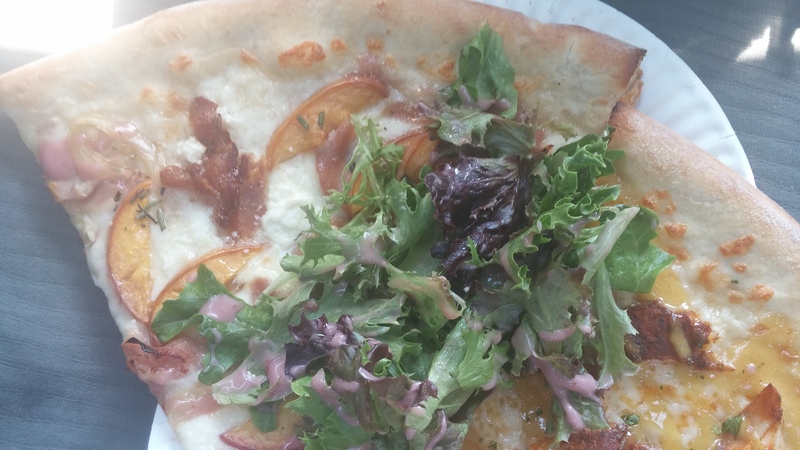 It includes bacon, red onions, and peaches! Yes peaches! And it was then topped with greens. You must pardon my excitement, I may be missing or incorrectly typing a topping or two but that’s the gist of it. I don’t believe they even had a name for it. But this was a very charming slice. I thought the lettuce (which I’m going to say was red leaf) would be too much, but it was a fantastic addition to this wonderful slice. I must say the peaches did it for me. This all came together superbly. If it was just a white pie with peaches I’d be happy too! Red onions were a welcome addition too. And the crust was heated so perfectly! What a wonderful crunch. And the way the cheese, and the toppings baked into the crust is aesthetically pleasing. This was creativity at its peak! Here is a picture with the lettuce off to the side, so you can get a great visual of what’s below! Magnifico! I did my first peach festival a few weeks ago, so I felt warm and fuzzy having this one too. This was a symbolic gesture from the universe and to myself as well. And just when you thought it couldn’t get anymore inspiring, we have the New Orleans! I visited New Orleans for the first time earlier this Summer, so this was more of a sentimental choice than anything. I was able to get a cheat sheet off the menu for this one. I was too excited at the time to remember all the toppings for this soulful slice. 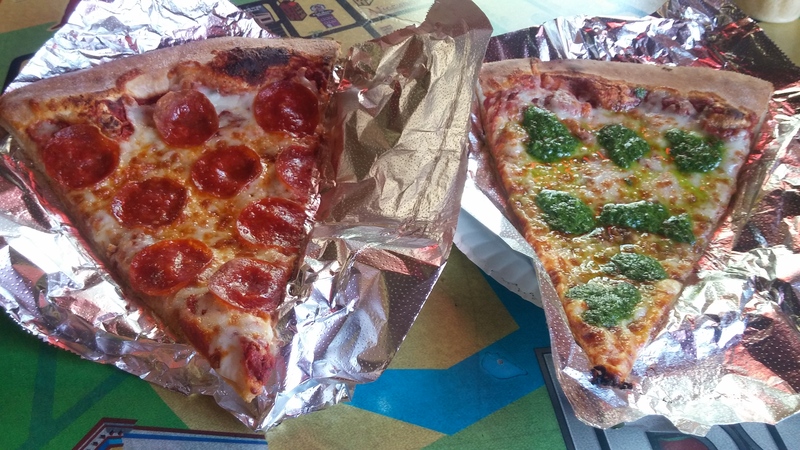 It’s amazing how one or two toppings can make or a break a slice. This one falls on the former. 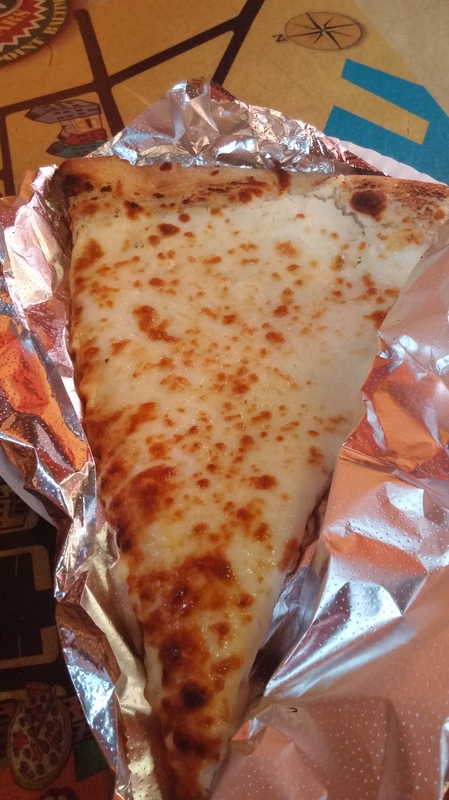 The mozzarella with the pepper jack cheese is a heck of a duo. I would have been happy with the slice as that. But even better, the honey dijon mustard and cajun chicken gives it some authentic New Orleans flavor. And again, it’s heated to perfection. As you can see their website is under construction but the pizza is anything but. 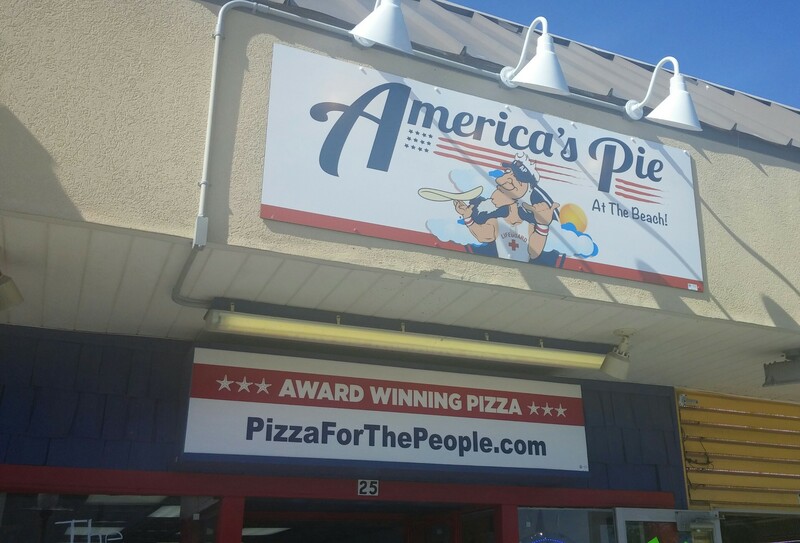 There were so many unique pies and slices to try that I hope I get to visit again very soon. It also seems they create stuff on the fly and that day. Like the first order I referred to, I was so excited I didn’t even get the name. I’m not sure if there even was one. Regardless, they were both wonderful. For more on my love of peaches, click here. And for my love of New Orleans, you can follow this link. I found out the place has only been open a month but they’re making a strong case for one of the best pizzas at the Eastern Shore. And I wish them all the best! And on a personal level these two slices were incredible representations of two of the more wonderful experiences I had this summer. (New Orleans and the Peach Festival) I doubt that’s a coincidence.